1:00-3:00 p.m. A cool, grey afternoon. Long walk in High Park. The landscape rich in browns and rusts and blackening rot. Squirrels busy. Paths quiet. Ice crystallizing across the pond. Later, at home, a waking dream. Body becomes liquid and runs through the soil of a forest floor. Flowing downwards. Dripping down into a deep, black subterranean pool. With each falling drop my awareness flies out across the surface. Body becomes water becoming waterfall. Expansion. Dissipation. Flow. A kind of release. This is the dance that I draw. Alice is curled up around me while I dream. Today marks the end of adanceaday. 365 dances in 365 days. This practice has been such a joy. So challenging. So rewarding. And, so much of the learning is still to come. 11:00-11:30 p.m. Beginning my goodbyes. adanceaday is coming to a close. I do a long, slow warm up in the study. Followed by a dance with the cool, bright night on the patio. Then I dance with Alice-the-cat. Some writing. Some contemplation. What has this practice taught me? What learning is still to come? Then another dance in the study. Finally, I kneel down on the floor of the study to draw. A joy is rising. Uplift. Warmth and fullness and anticipation. This is the dance that flies across the page. The day was cool. The sun shone bright. Alice wanders off. 11:00 p.m. A 5 minute dance in the study. Writing again all day today. Trying to articulate the rendering practices alive in the lively arts of protein modeling. The manuscript is crystallizing, not just precipitating out of solution. The dance pulls at space and bends time. The dance renders and so transforms space and time. Alice lounges in good company. The day looked cold from in here. 11:20 p.m. A 5 minute dance in the study. Plant energy unfurls. Tropic. Rotating. The dance feels like plant growth. I can feel plant knowledge rising up from my tissues. 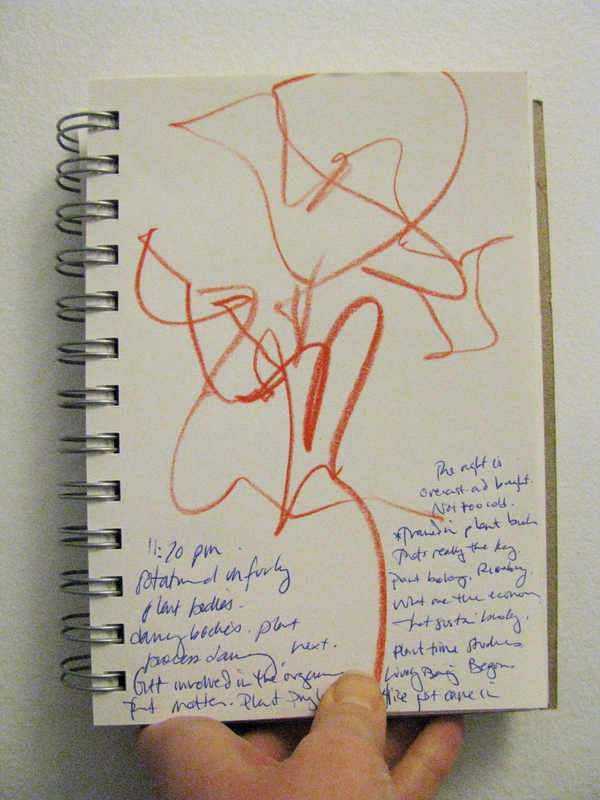 New ideas for research projects take root and shoot through me. These are not so much imaginary flowers but real world plant bodies and economies. The night is overcast and bright. Not too cold. Alice just came in from her prowl on the patio. 10:30 p.m. The solstice is coming. I’ve been sitting on the floor of the study reading material for the Rendering Life Itself course I teach starting in January. The dance is a brief and potent resonance with a new batch of flower tea. The potency of botanicals. Plant matters and materialities. I feel a new project in-gathering and just starting to unfurl. Pulsing below the surface. Alice lounges. The day began at -11 degrees Celsius and I joined the morning for a run. 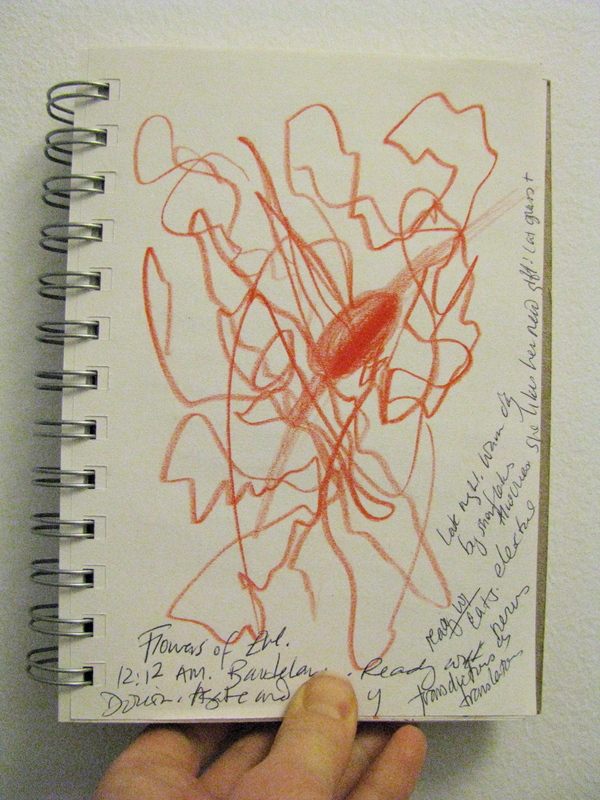 The drawing reminds me of the imaginary flower series I danced earlier this fall. Around midnight. I dance in the study after writing all day. The dance is full and fast and articulate. 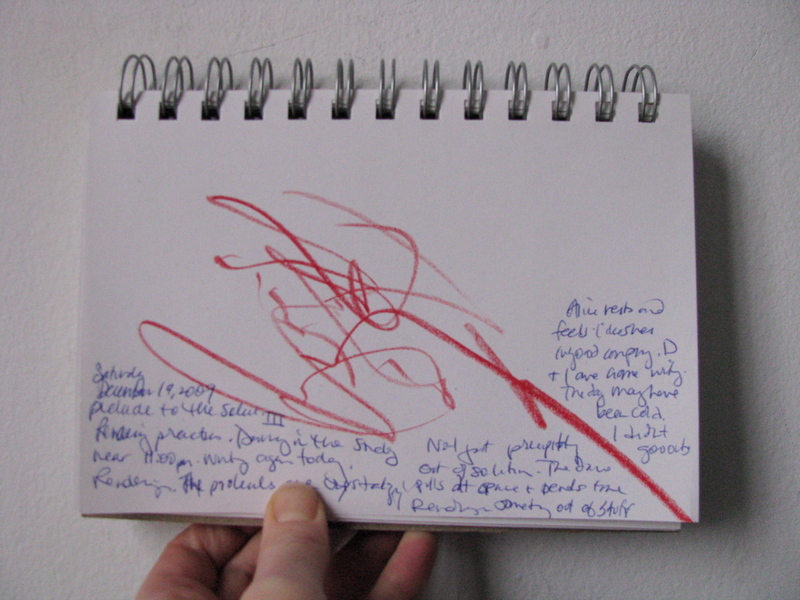 The drawing comes out like an energy diagram. 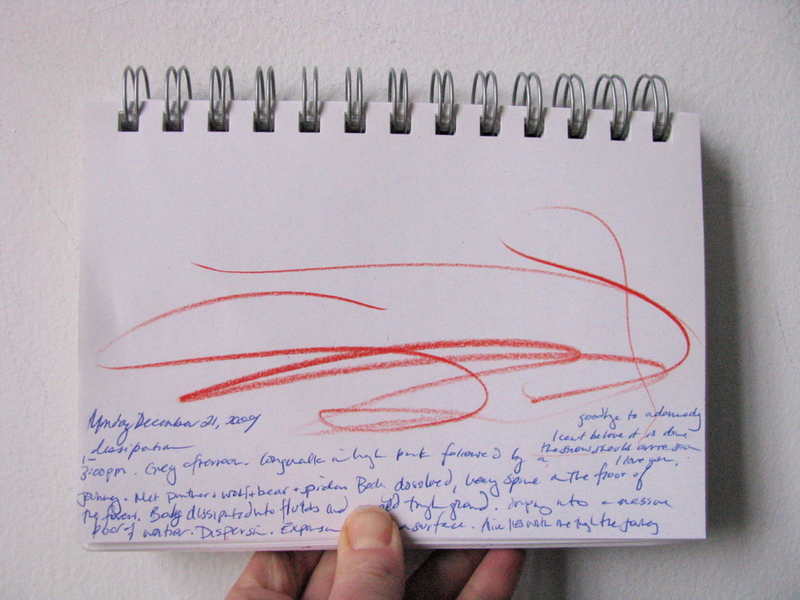 Hand set loose on paper to transduce the energy of the movements. I study the drawing after. I can put the memory of the dance back into the drawing. 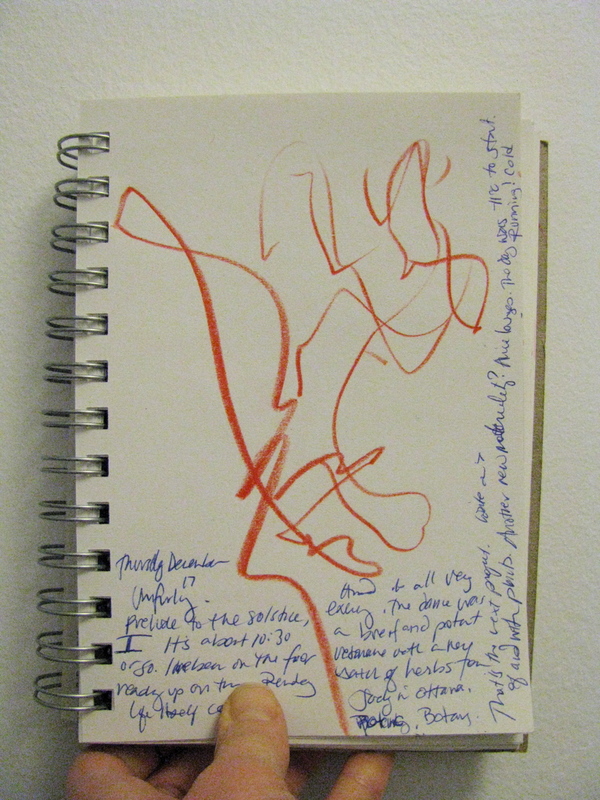 Rearticulating the lines through the feeling of the dance. Thinking with Barad (2007) and Prentice (2005) this feels like a kind of intra-articulation. 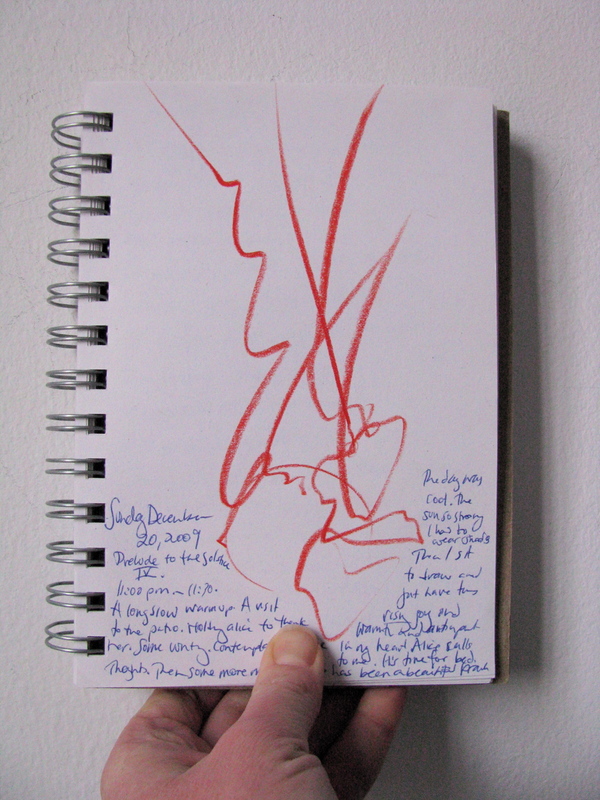 The phenomenon generated in this intra-action between dance and drawing is the intra-animate energetic memory I am left with once both dance and drawing are done. 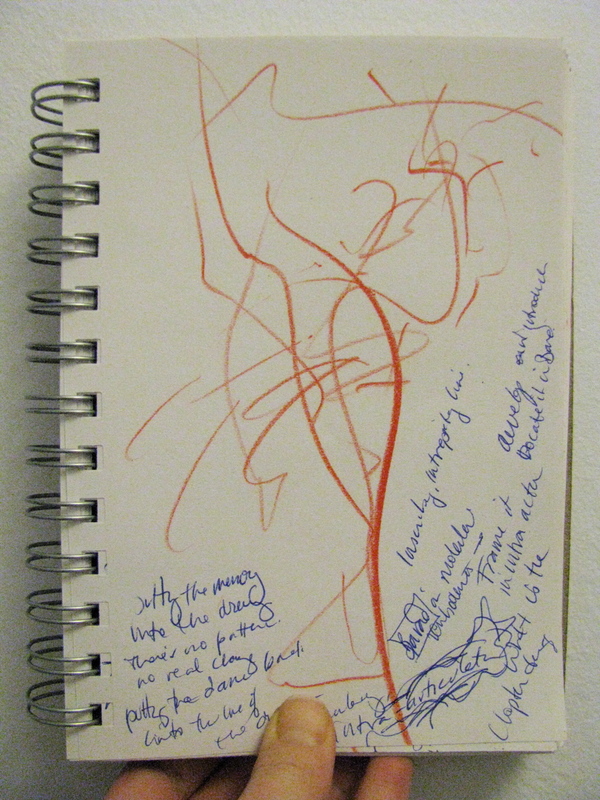 The memory of the dance articulates what I see in the drawing as the drawing rearticulates what I remember of the dance. 12:12 a.m. D reads Baudelaire’s “Le Chat,” from Flowers of Evil for Alice. Reading the poem first in French then each of the successive translations. Each translation feels much more like a transduction of sentiment, rhythm, affect, and sensation. The drawing feels through the sounds. Agate and metal and electric nerves. I keep drawing through a whole poem. A strange kinetic diagram. Late night, warm day with snowflakes. Alice cries and purrs.